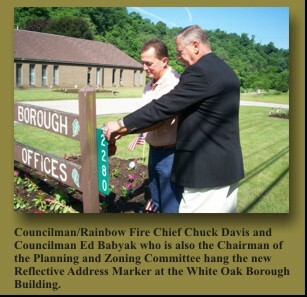 White Oak Borough Reflective Address Markers. 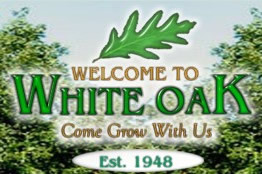 An Ordinance requiring all buildings and dwellings within the Borough be posted with proper identification numbers was passed at the March 29, 2007 public meeting of the White Oak Borough Council. This Ordinance was passed to assist emergency responders and ensure a quick response from them in the event of an emergency. 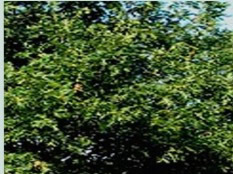 The Ordinance stipulates that all properties be identified within 60 days of the enactment of the Ordinance. The numbers shall be illuminated or made of reflective material and not be less than 3 inches in height. The numbers must also contrast with their background. Rainbow Volunteer Fire Company, White Oak #1 Volunteer Fire Company and White Oak EMS have agreed to make the signs and sell them as a fundraiser for $10.00 per sign. They can be ordered by picking up an order form from one of the Volunteer companies or at the Borough Office and returning the form with payment (make checks payable to White Oak Borough) to the Borough at 2280 Lincoln Way, White Oak, PA 15131. For your convienence you can download and print the Reflective Address Marker Order Form located here. 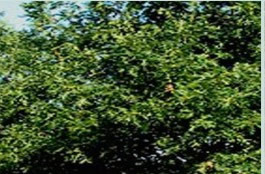 The file is in PDF format and will require that you have the Adobe Reader installed to view and print the file. If you need the Adobe Reader you can download it for free at this link. You may also purchase your address sign from any vendor of your choice as long as the sign meets the Borough requirements. If you have any questions call Michelle at the Borough Office at 412-672-9727.